"INJUSTICE ANYWHERE IS A THREAT TO JUSTICE EVERYWHERE." - MLK,JR. 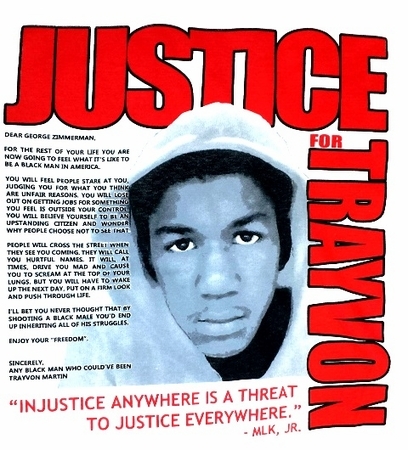 Show your support for the movement to demand justice for Trayvon Martin and the struggle against racism! DEAR GEORGE ZIMMERMAN, FOR THE REST OF YOUR LIFE YOUR GOING TO FEEL WHAT IT'S LIKE TO BE A BLACK MAN IN AMERICA. YOU WILL FEEL PEOPLE STARE AT YOU, JUDGING YOU FOR WHAT YOU THINK ARE UNFAIR REASONS. YOU WILL LOOSE OUT ON GETTING JOBS FOR SOMETHING YOU FEEL IS OUTSIDE OF YOUR CONTROL. YOU WILL BELIEVE YOURSELF TO BE AN OUTSTANDING CITIZEN AND WONDER WHY PEOPLE CHOOSE NOT TO SEE THAT. PEOPLE WILL CROSS THE STREET WHEN THEY SEE YOU COMING. THEY WILL CALL YOU HURTFUL NAMES. IT WILL, AT TIMES, DRIVE YOU MAD AND CAUSE YOU TO SCREAM AT THE TOP OF YOUR LUNGS. BUT YOU WILL HAVE TO WAKE UP THE NEXT DAY, PUT ON A FIRM LOOK AND PUSH THROUGH LIFE. I'LL BET YOU NEVER THOUGHT THAT BY SHOOTING A BLACK MALE YOU'D END UP INHERITING ALL OF HIS STRUGGLES. We have been honored to be asked by The Trayvon Martin Foundation to produce the shirts that will be given out to participants in their "I am Trayvon Day of Rememberance Peace Walk & Peace Talk 2015" that will be held in Miami next Saturday. Progressive Rags, will be donating 100 shirts that will be given out for free, however more shirts are needed! This week we are offering the "I am Trayvon Day of Remembrance Peace Walk" shirts online in order to raise funds to cover the costs to produce additional shirts that The Trayvon Martin Foundation wants to be given out at this action. We will also be donating the proceeds from our other shirts and buttons that protest Trayvon Martin's murder, so when you order one of these shirts, buttons, tote bags or hoodies you will be making a contribution to the Foundation's organizing efforts next weekend. To find out more information on the Trayvon Martin foundation and next weekends events please go to the link below.